I enjoyed the main Peculiar series by Ransom Riggs a lot and I like fairy tales usually, so when last year I saw Ransom wrote the Peculiar fairy tales down I needed to have it. I only got to it this year, but I liked it a lot. 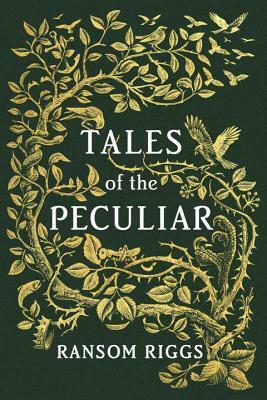 I give Tales of the Peculiar by Ransom Riggs five out of five hearts because these short tales were very enjoyable. Ransom’s Peculiar world is richer because of these tales, these are not the tales mentioned during the children’s search for their Ymbrynes, but they are still really funny and very creative. Overall I think these stories are better than the Peculiar series, because they have less negatives about them. I just love the short intruging stories about these people and with with them for a little bit. This entry was posted in Book Review and tagged Adventure, Book Review, Fantasy, Humor, Mystery, Novella, Ransom Riggs, Romance, Thriller. Bookmark the permalink.